TUNIS (Reuters) – Arab leaders, long divided by regional rivalries, condemned on Sunday a U.S. decision to recognize Israel’s sovereignty over the Golan Heights and said Middle East stability depended on creating an Palestinian state. 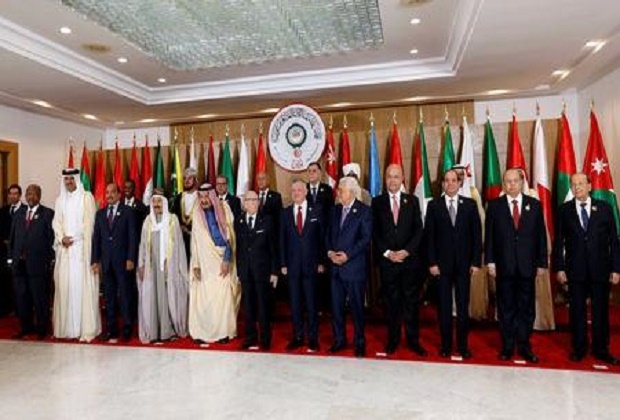 Arab leaders, gathering at summit in Tunis, have been under popular pressure to reject Washington’s action, while they also grapple with regional differences, including a bitter Gulf Arab dispute, splits over Iran’s regional influence, the war in Yemen and unrest in Algeria and Sudan. Saudi Arabia’s King Salman bin Abdulaziz told Arab monarchs, presidents and prime ministers at the meeting that his country “absolutely rejects” any measures affecting Syria’s sovereignty over the Golan Heights. President Donald Trump’s signed a proclamation last week recognizing the Golan Heights as part of Israel, which annexed the area in 1981 after capturing it from Syria in 1967. The Saudi king’s condemnation echoed those of Arab officials before Sunday’s summit of the Arab League, which usually ends with a final declaration agreed by the 22 member states. Trump’s Golan decision followed a U.S. move less than four months ago to recognize Jerusalem as Israel’s capital, a decision that also drew Arab condemnation. Palestinians want East Jerusalem as the capital of a future state. Qatar’s state news agency did not say why Tamim left, but Tunisia’s state news agency TAP said the rest of Qatar’s delegation stayed. King Salman, whose country has long vied with Iran for influence, called for confronting what he called the “aggressive policies of the Iranian regime”. He said Iran was interfering in Arab affairs, a charge Tehran dismisses. The leaders of Sudan and Algeria were not at Sunday’s meeting as both nations have been roiled by anti-government protests.